Mikaela Shiffrin, last year’s Audi FIS World Cup “Rookie of the Year” from Eagle/Vail, Colo., is making something of herself in her sophomore season with the U.S. Ski Team. The 17-year-old product of Vermont’s Burke Mountain Academy captured her first World Cup slalom win Thursday, Dec. 20 at Are, Sweden. In second place after the first run, Shiffrin clocked a nearly flawless second run to win by .39 seconds over Sweden’s hometown slalom star Frida Hansdotter. In the third women’s slalom of the 2012-13 World Cup season, Shiffrin vaulted into the top rank of slalom skiers on the women’s tour. She became the third-youngest American in history to win an Audi FIS Alpine World Cup. After her big win Shiffrin (17 years, 9 months, 7 days) ranked behind Kiki Cutter (16 years, 7 months, 1 day) and Judy Nagel (17 years, 5 months, 12 days). Now, Shiffrin leads the Audi FIS Alpine World Cup slalom standings by 22 points over Germany's Maria Hoefl-Riesch, by a 196-174 count. She is 11th in the overall standings. Her previous best World Cup slalom finishes, both podiums for third place, came last Dec. 29 at Lienz, Austria and in this season’s slalom opener Nov. 10 at Levi, Finland. Shiffrin also tied for ninth in slalom at Are last March 10. She ended her rookie season last March in 17th place in the slalom standings with 163 points. Shiffrin came close to that with 100 points for winning Thursday’s race, and increased her slalom point total to 196 points. Slovenia’s Tina Maze, 29, continues to lead the World Cup overall standings—improving her big lead to nearly 400 points. And Shiffrin moved into 17th place in the overall. Maze has 919 points ahead of second-place Hoefl-Riesch (532). (468). In third place is Kathrin Zettel of Austria (466) with American Lindsey Vonn in fourth (414). Julia Mancuso has seventh place with 345 points and Shiffrin is 11th with 254. In updated men’s overall standings, Ligety dropped to third place with 537 points behind leader Aksel Lund Svindal, 29, of Norway (614). Ligety leads GS standings 360-320 over Austria’s Marcel Hirscher, who stands second in the overall standings with 560 points. The Audi FIS Alpine World Cup travels to Semmering, Austria, just outside Vienna, for a giant slalom and slalom Friday and Saturday, Dec. 28-29. Men race downhill at Bormio, Italy on Saturday, Dec. 29. ( Ted Ligety, 28, of Park City, Utah survived a tricky first set and produced a solid final run to finish ninth in Tuesday’s night slalom at Madonna Di Campiglio, Italy. It was Ligety’s first slalom top 10 of the season. Austrian Marcel Hirscher landed a Ligety-esque victory with a 1.67 margin over Felix Neureuther of Germany as Japan's Naoki Yuasa finished third. Thousands, including Italian great Alberto Tomba, lined the flood lit slope as the Audi FIS Alpine World Cup returned to Madonna di Campiglio for the first time since 2005. Ligety has improved his slalom results with each start this season. He was 13th in the opening race in Levi, Finland and 12th in Val d'Isere, France. He will compete again today, Thursday in Alpine Rockfest, an exhibition dual giant slalom in Andalo, Italy with 70,000 Euro going to the winner. ( Julia Mancuso, 28, of Squaw Valley, Ca. skied a brilliant bottom section to finish 14th in Wednesday's Audi FIS Alpine World Cup giant slalom held under the lights at Are. Shiffrin had also made the final with the 17th-fastest opening run, but hooked a gate with her right shoulder and was bounced off course. German Olympic GS champion Viktoria Rebensburg halted the four-race discipline win streak of Slovenia's Tina Maze with her first victory of the season. 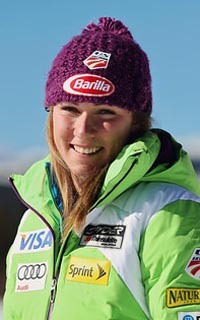 Maze finished third behind Anna Fenninger of Austria. Amazingly, a win by the dominant Maze would have locked up the 2013 season GS title for her, while we’re still in 2012.